Robokind aims to change the way humans interact with robots with its latest model, the ZENO R25. The robot sports a variety of social features and is able to carry out a conversation with the user. Robokind stemmed from Hanson Robotics, founded by David Hanson, who received his Ph.D. in 2007 from UT Dallas. He is well-known for his work on life-like robotics, including a 2009 TED talk where he presented a robotic Albert Einstein that responded to his emotions. The company employs many UT Dallas graduates and has been developing similar robots for years. While the R25 robots utilize open source software and can be programmed for a wide range of uses, some of the intended purposes for the robot include use as a teaching tool and for autism therapy. A touch screen on the R25’s chest can be used to display questions and accept multiple choice answers. Internal components of the robot can stream video to nearby tablet computers and conduct lessons or quizzes. Arts and Technology alumnus Justin Holder said while the robot’s life-like features and expressions help to make it easy to relate with, the technology behind the R25 allows it to easily maintain dialog with autistic children. Holder uses his ATEC training to serve as the middleman for the programmers in charge of the robot’s behavior and the modelers who manage the robot’s movements. His knowledge of both worlds allows him to see where in the pipeline a problem is and to help fix it. He said that while most of the people working at Robokind have degrees in computer science or engineering, many other fields of study are also present in the company, including a geology graduate. The ZENO R25 is an advanced robot that contains sensors that allow it to respond to touch on its body, detect where speech is coming from and perceive emotions. However, one of the key differences that make it stand out from its competitors is the price. Currently, the R25 preorder is available through Kickstarter for less than $3,000. Robokind hopes to raise $50,000 through the crowdfunding website and had four R25s preordered at the time this article was written. This article, written by Joseph Mancuso, was featured in The Mercury, the student newspaper of UT Dallas. Ashbel Smith Professor of Arts and Technology Mihai Nadin was recently interviewed by Dichtung Digital, one of the leading international journals on digital literature and aesthetics. Nadin is a scholar and researcher in electrical engineering, computer science, aesthetics, semiotics, human-computer interaction (HCI), computational design, post-industrial society, and anticipatory systems. His publications on these topics number over 200, and he has lectured throughout the world. He is currently director of the Institute for Research in Anticipatory Systems. Nadin is also a member of the Advisory Committee of University of the People. Founder and editor of Dichtung Digital Roberto Simanowski interviewed Nadin. There is no such thing as “digital art” just as there is no “digital humanities”. Something qualifies as art (or humanities) or it does not. All the formulations that have emerged parallel to increased computer use are an attempt to signal keeping pace with science and technology; but fundamentally they do nothing to define new forms of writing and composing, new types of performance. In reality, “Humanities” is the expression of resistance. Those involved in humanities probe the science and technology instead of automatically accepting them. Data becomes information only when it is associated with meaning. However, our age is one of unreflected data generation, not one of quest for meaning. Data production (“Give me the numbers!”) is the new religion. Politics, economics, and science are all reduced to data production. Ownership of data replaced ownership of land, tools, and machines. Human interaction is also reduced to data production: what we buy, where we buy, whom we talk to, for how long, how often, etc. The Internet as the conduit for data is boring and deceiving. This is not what Vinton Cerf, to whose name the global transmission protocol TCP/IP is attached, had in mind. It turns out that quite a number of problems – the most interesting ones, actually – are not algorithmic. Protein folding, essential in living processes, is one example. So is computer graphics, involving interactive elements. Furthermore, adaptive processes can not be described through algorithmic rules. More important, anticipatory processes refuse to fit into neat algorithmic schemes. At the time when I advanced the notion that the computer is a semiotic engine, my enthusiasm was way ahead of my ability to understand that the so-called universal machine is actually one of many others. Today we know of DNA programming, neural network computation, and membrane computation, some equivalent to a Turing machine, some not. Read the full interview on Dichtung Digital. More than 1,000 students, faculty, staff and University supporters attended a dedication ceremony in the lecture hall of the Edith O’Donnell Arts and Technology Building. Students, faculty and staff welcomed longtime UT Dallas supporters Edith and Peter O’Donnell and their guests to the Nov. 7 dedication of the new Arts and Technology Building named in Mrs. O’Donnell’s honor. The 155,000-square-foot building was designed by STUDIOS Architecture – the same firm that designed Google’s headquarters in Mountain View, Calif. It includes a 1,200-seat lecture hall, a motion capture lab, soundproof chambers and 3-D fabrication labs, as well as classrooms for game design, sound design and visual arts among others. An audience of more than 1,000 people stood to greet the O’Donnells with rousing applause as they took their seats on stage in the lecture hall. Peter O’Donnell said that naming the building for his wife is a fitting tribute because the Arts and Technology Program (ATEC) reflects her enduring passion for arts and technology. Edith and Peter O’Donnell, longtime higher education and UT Dallas supporters, shared a moment during the dedication ceremony. Mr. O’Donnell remembered the campus as little more than a cotton field in the 1960s. Texas Instruments co-founders Eugene McDermott, Cecil Green and Erik Jonsson had established the research institution that formally became UT Dallas in 1969. In less than 50 years, “with inspired leadership, consistent support from the business sector and the magnificent generosity of Margaret McDermott, UT Dallas has become a highly respected research university,” Mr. O’Donnell added. “When we first toured the building two weeks ago, we thought it was breathtaking. And we’ve been in a lot of art buildings all over the world. But this one is exceptional. We felt the energy and excitement of the students and faculty. Edith observed that the building inspires creativity. And Edith knows creativity. ATEC is well-positioned to solve new problems in a whole new way,” O’Donnell said. Dr. Francisco Cigarroa, chancellor of The University of Texas System, and UT System Regent Ernest Aliseda both spoke during the dedication. Other guests included a number of legislators and city council members from Richardson and Plano. Former U.S. Senator Kay Bailey Hutchison chatted with other University supporters after the dedication ceremony. He commended the ATEC program as “one of the most innovative 21st century programs in The University of Texas System, if not in this great United States of America, bringing the arts and humanities together with science and technology in a fusion of creative thinking.” He also thanked the O’Donnells for their philanthropy to the entire UT System. Student work was on display during the dedication ceremony and throughout the day as guests took self-guided tours of labs and studios. As guests arrived, photographs of the new building were projected on a large screen in the lecture hall, demonstrating the creative ability of the students enrolled in Professor Marilyn Waligore’s photography classes. Students in the UT Dallas Woodwind Quintet performed as the audience gathered for the ceremony, and senior lecturer Kelly Durbin played the piano as people filed into the lecture hall. Students gathered near the wood version of artist Liz Larner’s “X” sculpture. A stainless steel version is located in the courtyard of the building as part of the citywide exhibition, Nasher XChange. After the dedication ceremony, students, faculty and staff mingled with guests and gathered outside to admire the building’s facade, as well as the stainless steel “X” sculpture commissioned by the Nasher Sculpture Center for the city-wide exhibition, Nasher XChange. The steel sculpture and a wood replica displayed inside the building were created by the internationally renowned artist Liz Larner. Sproull is also President of the Metroplex Technology Business Council, the largest technology trade association in Texas, representing a quarter million employees through its 300 member companies. In September 2013 Dr. Kim Knight was invited to speak at the Digital Frontiers Conference at The University of North Texas. She invited two of her former students and one PhD student to attend the conference and speak on a panel with her about Fashioning Circuits. Among the students were graduate student Rasundra Harvey, undergraduate student Patti McLetchie, and PhD candidate Brianni Neson. Patti McLetchie attended the conference and also went to the THAT camp was scheduled the day after the conference ended. If you don’t know what a THAT camp is the basic an unconference is to a conference what a seminar is to a lecture, what a party at your house is to a church wedding, what a pick-up game of Ultimate Frisbee is to an NBA game, what a jam band is to a symphony orchestra: it’s more informal and more participatory. THAT camp, short for The Humanities and Technology Camp, are specific to the humanities and are quite fun to attend if you haven’t been to one before. Before the conference you can propose a topic or a session but it is really about the day of the camp that the participants decide what will be talked about. Find out more information about upcoming events, visit the THAT Camp website. Dr. Rosanna Guadagno, Candidate for Associate Professor in Emerging Media and Communication will give a presentation on Wednesday, Dec. 4 at 10 am 4 pm in ATEC 3.205 entitled Why We Click: An Examination of Social Influence Processes Online. Dr. Guadagno received her Ph.D. in Social Psychology from Arizona State University. Her masters and dissertation examined communication mode and gender as moderators of persuasion. To extend her knowledge on the impact of technology on social interaction, Dr. Guadagno’s completed a postdoctoral research fellow at the Research Center for Virtual Environments and Behavior at the University of California, Santa Barbara where she studied persuasion and non-verbal behavior in immersive virtual environments. Dr. Guadagno then moved to the University of Alabama where she was a founding faculty member of the Social Psychology Program, and its Director for three years. During this time, she also founded and still runs the Online Social Influence Lab (OSIL; www.onlinesocialinfluence.net). Dr. Guadagno is currently at the National Science Foundation serving as a Program Director for Social Psychology as well as the Science of Learning Centers. In general, Dr. Guadagno’s research focuses on three main areas, all of which were briefly mentioned above: Social Influence and Persuasion, Social Behavior and Technology, and Gender Roles. She has many publications in each of these three main foci. Freshmen dressed up and collected funds for UNICEF as part of a project for their Freshman Year Experience course. Project members are: (from left) Lindsay Nussbaum, Vinchenzo Locascio, Augustus Strickland, Erin Derocher and Katherine Risor, with advisor Tessa Thibodeau. Advisors in the School of Arts and Humanities admitted they had some misgivings about asking freshmen to develop and organize a class volunteer project entirely on their own. The project was assigned as part of Arts and Humanities (ARHM) 1100 and University (UNIV) 1010, courses in the Freshman Year Experience program that teaches freshmen how to succeed at UT Dallas. Both courses are required for all arts and humanities freshmen. Dr. Shelley Lane, associate dean for undergraduate education in the School of Arts and Humanities, and Megan Gray, assistant director for the humanities, are ARHM 1100 instructors who developed the volunteer project and worked with advisors who teach UNIV 1010 to integrate the assignment into their sections. On the one hand, advisors said it was important for students to take initiative, especially when it involves serving others. But would these new students be realistic in the scope of their projects and think of all the details needed for a successful outcome? (From left) Arts and Humanities freshmen Desi Alicea-Aponte, Andy Garcia, Alan Piper and Marc Forestier sold baked goods to raise $56 for Push America, which provides playground equipment for children with disabilities. Students came through – and then some. Working in their UNIV 1010 groups of about 20 students, they planned the logistics for an on-campus project during a single class session. For their project, they branched out across campus to sell baked goods, organized games for charity and collected canned goods for needy students. Some danced for charity. Others took “selfies” – photos of themselves posted to social media venues – showing them donating cash or goods to encourage others to also give. Still others dressed up in Halloween outfits to draw attention to their cause. All the money and goods collected went to a charity of their choice, from UNICEF to Comet Cupboard. In early November, students shared the results in class. Arts and Technology (ATEC) freshman Audon Archibald said his UNIV 1010 section helped organize a “nerdy tournament” of video games, which raised $84 for Child’s Play, an international game industry charity that provides toys and games to hospitalized children. “After we played the games, we ended up sitting around talking, sharing trading cards, eating cupcakes – and paying for it,” Archibald said. Michael Burdick said his group set up a table in the Comet Cafe in the Student Union to collect donated nonperishable items for Comet Cupboard, a food pantry initiative at UT Dallas that helps students in need. “We took donations of food, and a little stuff added up together for a worthy cause,” said Burdick, an ATEC student. Freshmen enrolled in ARHM 1100 learn about the School of Arts and Humanities’ intellectual and cultural environment through lectures, group projects, activities, guest panels, and by attending artistic and cultural events. They also learn about the school’s majors, research opportunities, careers and internships. Lane said the volunteer component of the class was added to help students learn to solve problems, work to improve lives and feel more connected on campus. “The more engaged a student is in campus life, the more they will persist through to graduation,” Lane said. ATEC and EMAC undergraduate advisor Bobby Frye said it was interesting to see students take charge of the project. The new feature film Free Birds is a digital showcase for the finely detailed work of local animators, including four UT Dallas alumni who contributed to the project. Sing Khamnouane BA’05, MFA’08; Kenneth Kanipe BA’09; Nicholas Shirsty BA’10, MFA’13; and Edward Whetstone BA’11 graduated from the Arts and Technology (ATEC) program and now work at Reel FX Creative Studios, a visual effects company in Dallas that animated the film. “We’re responsible more or less for putting together the final image that ends up on screen,” said Whetstone, a lighting and compositing artist. The film opened Nov. 1 in theaters nationwide. It centers on two buddy turkeys, Reggie (voiced by Owen Wilson) and Jake (Woody Harrelson), who travel back in time with feisty fellow turkey Jenny (Amy Poehler) to the first Thanksgiving, in an attempt to take turkey off the holiday menu. It may sound simple, but animating a full-length feature is incredibly time-intensive and highly technical, said Eric Farrar, assistant professor of 3-D computer animation who taught three of the four alumni. Animation work is broken down into specialized phases, Farrar said. First, working from 2-D drawings, modelers, like Khamnouane, build 3-D static wireframe models on the computer. Khamnouane built Free Birds characters that included the president’s daughter, baby turkeys and Chief Broadbeak. “We produce an accurate translation of the 2-D concept art into the 3-D world. So basically everything you see on screen was built by a modeler,” Khamnouane said. Then rigging artists, like Kanipe, take the models and create joints and bones and control handles, which allow the models “to move in an intuitive way,” Farrar said. Kanipe said he and other rigging artists created a skeletal system for each piece of geometry used in the movie – characters, vehicles, props and environments. Next, character animators take the rig “and put it through its paces and really bring the character to life,” Farrar said. Lighting and compositing artists, like Shirsty and Whetstone, then add nuance to each scene. The next step is rendering, where the computer interprets the settings and colors the lighter has set up, as well as the textures and colors painted on the 3-D models of the characters and environments. It can take several hours per frame to render a single character, Shirsty said. And many shots might have hundreds of characters. Free Birds was filmed in 24 frames per second and stereoscopic 3-D, Shirsty said. So for each second of footage on the screen, 48 different images had to be generated – 24 for the right eye and 24 for the left. The last step of the process is called compositing, where the artist compiles an image from multiple layers – including the reflections and shadows – to create the final frame of the film. During this phase, color correction and final tweaks are done, Whetstone said. Kanipe said that working with ATEC professors like Todd Fechter and Farrar helped prepare him for the animation industry. For example, he studied rigging with Farrar for a motion capture project at the Callier Center for Communication Disorders, in which speech therapists attached sensors to track the positions of the tongue to provide visual feedback that could improve a patient’s therapy. He also learned the importance of working together on an animation project. “This is a rare industry where you need an entire team to work the many facets,” Kanipe said. “The projects we did making the digital shorts at UT Dallas were eye-opening in seeing how other people worked and got the job done. “In art, unlike other professions, there is no one right way to get something done. There are many avenues one can take, and the more I learned from what other people did, the better a student and artist I became,” Kanipe said. Shirsty said the animation production classes at UT Dallas and the quality of faculty equipped him to be able to put together a computer-generated project. “The animation production classes were an especially good simulation, and having professors who have worked in the industry was a key factor in developing my skills to be able to work on a feature film,” Shirsty said. The alumni agreed that their ATEC degrees have helped launch their careers. And having worked on a feature film is a thrilling accomplishment that speaks well of the program. A private screening of the movie for UT Dallas alumni is planned as part of Homecoming 2013 festivities. The already sold out event at the Alamo Drafthouse will feature an appearance by the alumni who worked on the film. 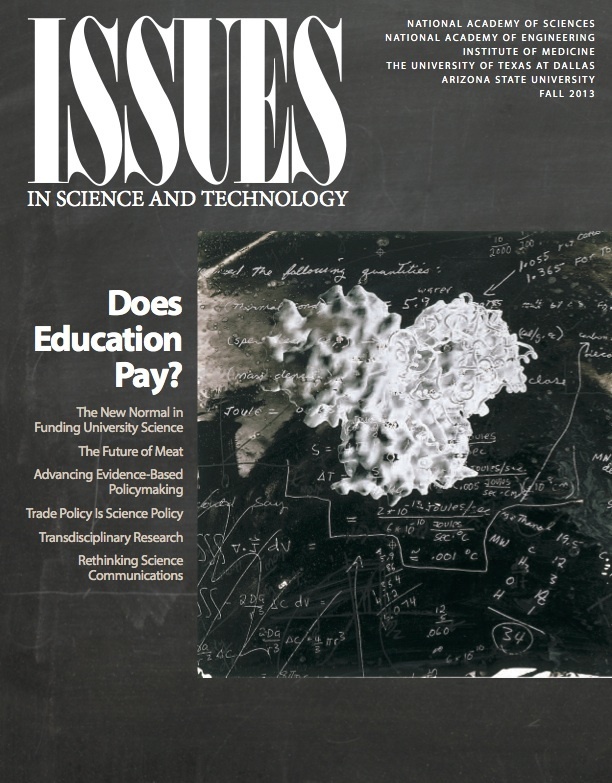 The work of alumnus Paul Slocum (BS ’01) is featured in the fall 2013 issue of Issues in Science and Technology, an award-winning journal of the National Academy of Sciences, National Academy of Engineering, Institute of Medicine, and The University of Texas at Dallas. Paul Slocum is an artist, software developer, curator and musician. He previously directed a new media art gallery in Dallas called And/Or Gallery and is now operating an iOS software company in Brooklyn called SOFTOFT TECHECH that creates music and art apps. 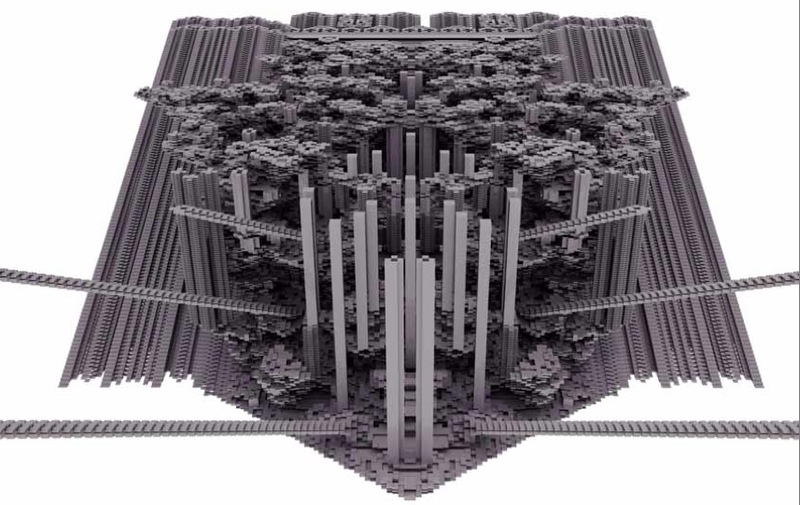 Slocum’s work, featured on page 96 of the magazine, was made by extruding the time domain sequences of Conway’s Game of Life, a cellular automaton devised by the British mathematician John Horton Conway in 1970. Time is equated to the Z-axis and then rendered in a ray tracer. Each frame of the Game of Life sequence becomes a layer in a stack to form a complex static object. He has performed music and exhibited artwork internationally at numerous venues including The New Museum of Contemporary Art and Andrea Rosen Gallery in New York, The National Center for the Arts in Mexico City, README Software Art Conference in Denmark, The Liverpool Biennial, Museum of Contemporary Art Denver, The Dallas Museum of Art and the Contemporary Arts Museum Houston.